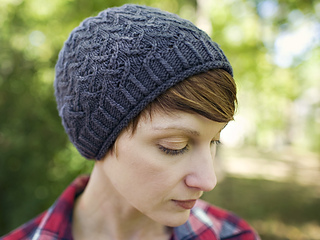 Stax is a simple beanie in a stacked lace pattern. Make it in regular (shown) or slouchy depth. 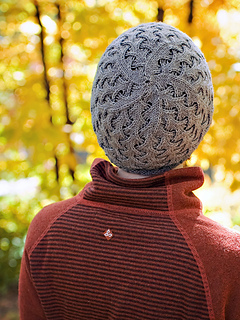 Pattern is written for one circumference to fit the average adult female with two depths – beanie (shown) or slouch. When applicable, directions for the slouch version are written in parentheses as follows: beanie (slouch). Measurements are taken post-blocking. YARN: Approximately 180 (220) yards of sport weight yarn. Sample was knit with Plucky Knitter Traveler Sport in “Flannel” (65% Merino, 20% Silk, 15% Yak; 320 yds/100 g per skein). NEEDLES: dpns and 16” circular needle in US 4 (3.5mm) or size required to obtain gauge.